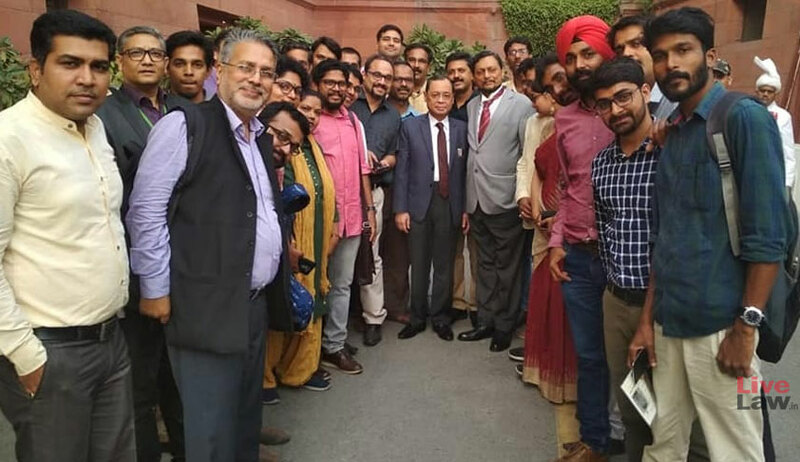 The Chief Justice of India Ranjan Gogoi visited the press lounge of the Supreme Court today to have an informal interaction with the journalists covering court news for various media houses. During the interaction, the CJI told that he was surprised by the "unprecedented" speed with which the Government cleared the names of four judges within 48 hours of the collegium recommending their names. The CJI was referring to the swearing in of four new SC judges- Justices Hemant Gupta, Subhash Reddy, M R Shah and Ajay Rastogi today. Incidentally, the CJI had today remarked in the Court that almost 39 names which were recommended by the SC collegium were pending with the Government. This remark came while considering a petition filed by Centre For Public Interest Litigation seeking to direct the Centre to clear the names which were recommended by the SC Collegium for judicial appointment. The CJI assured that he will address the issue on the administrative side. In the case of Justice K M Joseph too, the Centre had dragged its decision for months, before returning his name through an unprecedented act of splitting the SC recommendation to notify only the appointment of Justice Indu Malhotra. In this backdrop, the 'surprise' expressed by him at the Centre's prompt action with respect to the four new appointees assume relevance. In the press interaction, the CJI also revealed plans to give translated copies of SC judgments to litigants in their mother tongue if they are unable to understand English. The CJI also acknowledged that the appointment of Justice Dave as acting CJ of Gujarat HC instead of Justice Kureshi happened by an oversight and that the mistake as corrected soon as it was realised. The CJI also assured that the amenities of press lounge will be improved and expressed Diwali greetings to all.